I received compensation for this post as part of a promotional program with HP and MomSelect but all opinions are 100% my own and may differ from yours. I will only endorse companies, products and services that I believe, based on my own experiences, are worthy of endorsement. I use my printer a LOT. Not as much as my middle schooler, but a lot. If you have a middle school or high school age child, you know what I mean. My son spends a lot of time doing homework that has to be printed out and the last thing I want is for him to start to print something to discover we are out of ink. We tend to run out of certain colors over others and I like to keep stocked up on all ink colors, just in case. Why is it when we replace a color cartridge, we need to replace the black ink cartridge soon after? It’s one of those questions I have, like “Where do the missing socks go in the dryer?” We may never really know the answer. But I digress… Because of this, I look for deals on printer ink from time to time and this deal on HP ink is one I had to share with YOU! 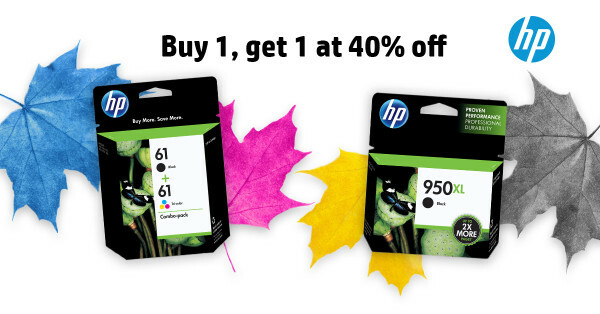 Right now when you buy one original HP ink, you get the 2nd cartridge of equal or lesser value for 40% off! This awesome deal is not only available on the HP website, but at retailers such as Staples, Best Buy, Office Depot, and Office Max, as well. I hope you can take advantage of this amazing deal on HP ink, I know I will be! HURRY, this deal ends on 10/10! i can appreciate money off of ink because it is so expensive!